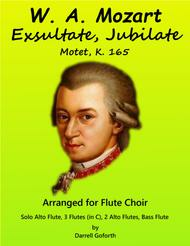 Composed by W. A Mozart. Arranged by Darrell Goforth. Classical Period, General Worship, General Instructional, Technique Training. Score, Set of Parts. 50 pages. Published by Darrell Goforth (S0.75187). This solo motet was written in 1773 in Milan where Mozart was in production of his opera "Lucio Silla". 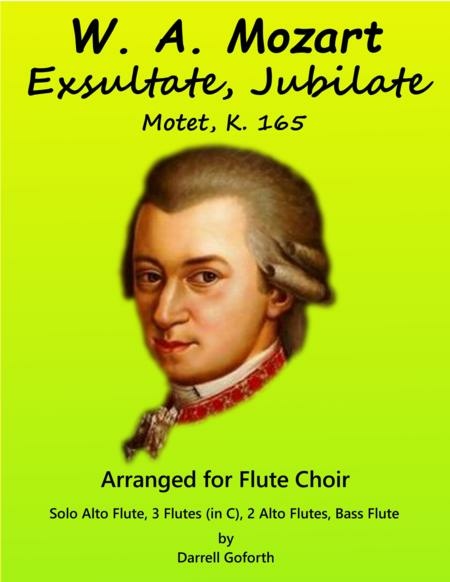 It was written for his lead singer, Venanzio Rauzzini, and first performed at the Theatine Church in January, 1773.Although the theme is somewhat religious in nature, it is suitable for any concert or educational setting.I have presented this piece in its original key for Solo Alto Flute with accompaniment of 3 Flutes in C, 3 Alto Flutes and Bass Flute. .